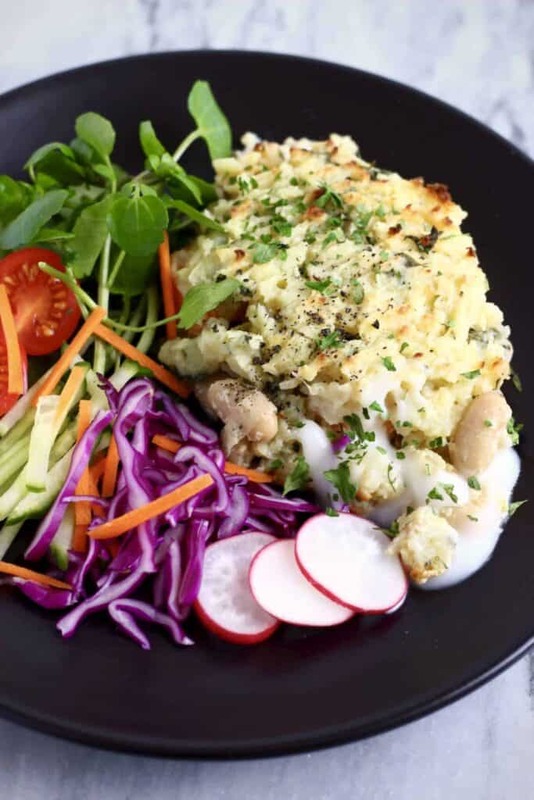 This Gluten-Free Vegan Fish Pie is the best comfort food! 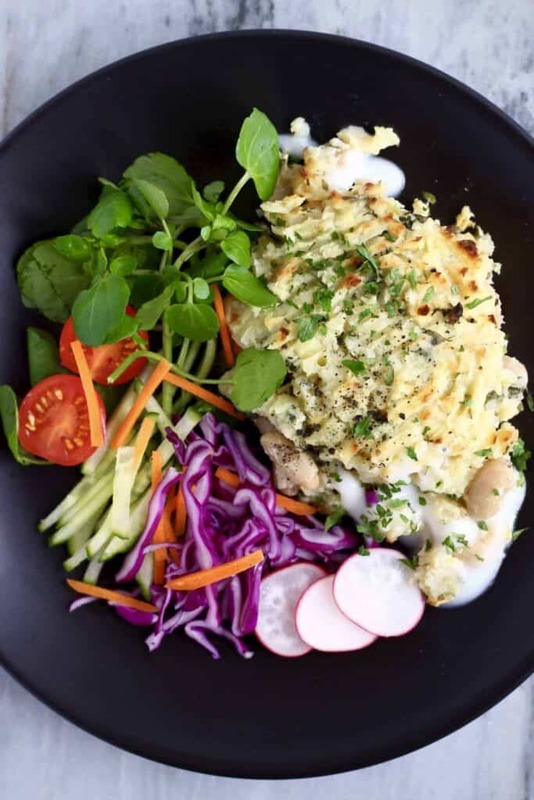 It’s packed full of flavour, super creamy and full of protein and fibre! It’s a little more time-consuming than some of my other recipes, but it’s easy to put together and definitely worth the wait! Once you’ve made the sauce and mashed potatoes, you can just throw it in the oven and go get on with something else. The sauce really makes this dish, and it starts off with leeks and fennel. If you haven’t cooked with fennel before, I couldn’t recommend it more! It might not look like much, but it completely loses it’s aniseed flavour once cooked, and turns incredibly sweet and flavourful. It pairs really well with the white wine, which adds the most amazing fragrance. 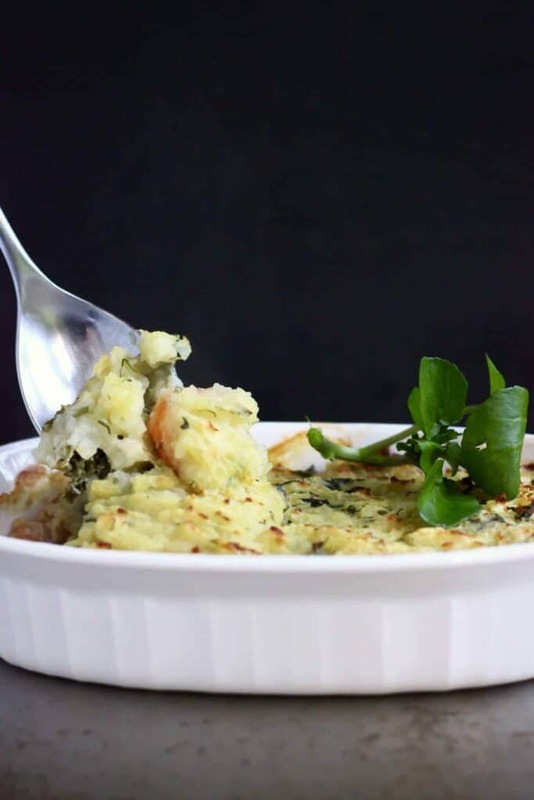 The base of the creamy sauce was inspired by the sauce for this Vegan Potato Dauphinoise Gratin, which is made using unsweetened almond milk (you can use oat milk for a nut-free version) thickened with cornflour. It’s thick and creamy, and has a neutral flavour, meaning it provides a great base for a number of sauces. I also added plenty of herbs to the sauce, such as fresh parsley or dill, as well as some capers for a salty, umami-rich flavour reminiscent of fish or seafood! And to replace the fish, I went with white beans, which have a similarly neutral taste, and work wonderfully to soak up all the other flavours of the sauce. They also add plenty of protein and fibre. I decided to jazz up the mashed potato topping with some more fresh herbs (parsley or dill), cheesy nutritional yeast and good handful of peppery watercress. 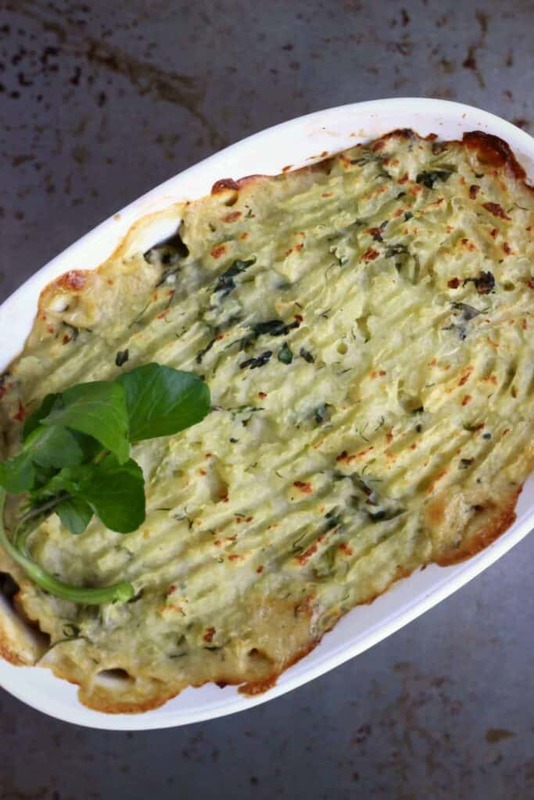 The kick from the watercress really balances out the creaminess of the sauce, and the velvety texture of the mashed potatoes, whilst also adding extra colour, and is a great way of sneaking in extra vegetables! If you want to make this dish even more nutritious, you can use sweet potatoes instead of regular potatoes, or even cauliflower or celeriac. To create maximum crispy bits on the top, I like to score the mashed potatoes with a fork to create a rough surface, which provides more potential for crispy bits. 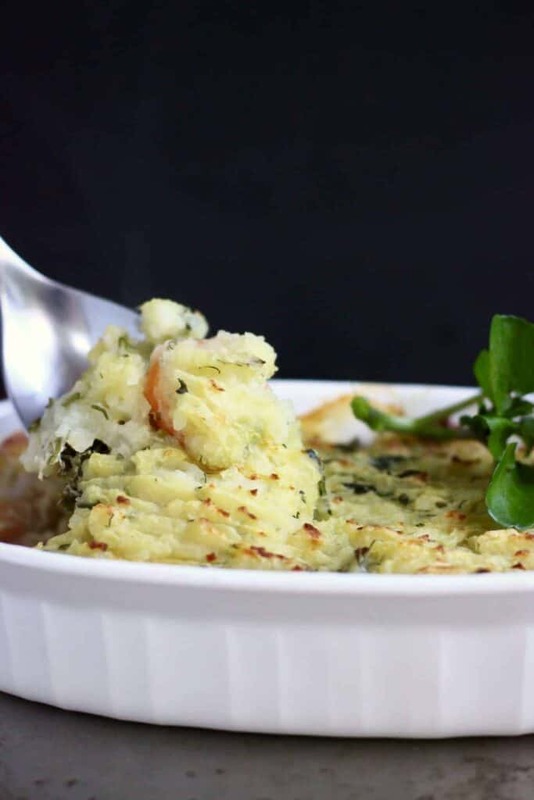 I hope you’ll love this Gluten-Free Vegan Fish Pie! It’s a wonderful combination of flavours and textures and seriously nutritious too. 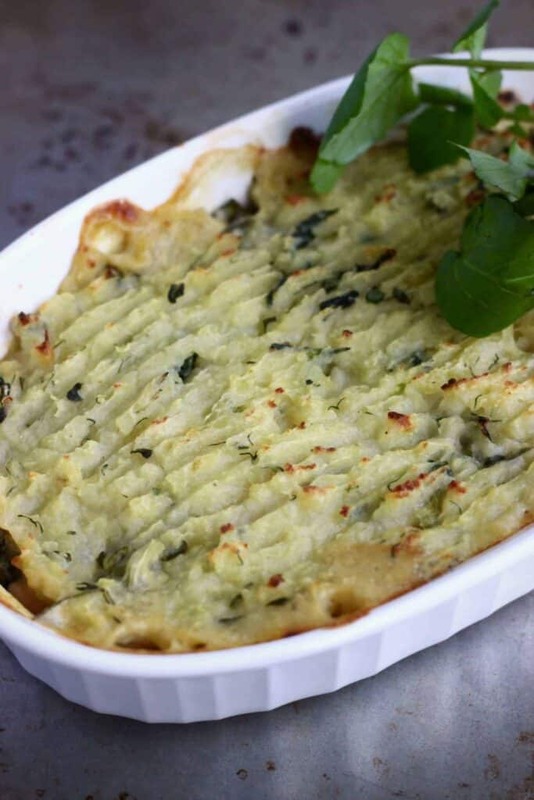 This Gluten-Free Vegan Fish Pie is the best comfort food! 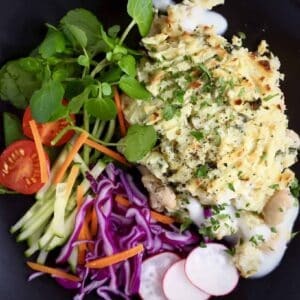 It's packed full of flavour, super creamy and full of protein and fibre! Score the top of the mashed potatoes with a fork to roughen the surface for more crispy bits! Made this for my kids and it went down a treat!